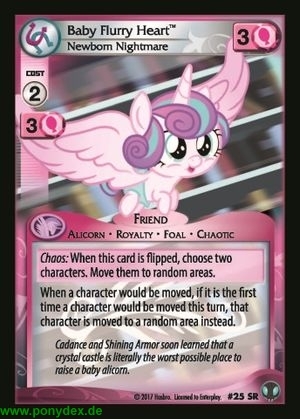 Chaos: When this card is flipped, choose two characters. Move them to random areas. When a character would be moved, if it is the first time a character would be moved this turn, that character is moved to a random area instead. Cadance and Shining Armor soon learned that a crystal castle is literally the worst possible place to raise a baby alicorn.